Time: It’s very difficult for an in-house team to dedicate the time and resources that a thorough assessment requires; as a result, in-house assessments hinder day-to-day activities, are subject to situational neglect and interruptions, lose momentum, and take longer to complete. Often, results are ignored or discounted by the final decision makers. Perspective: An in-house team by its nature has a narrow industry focus; many business technologies, however, have applications across manufacturing sectors. Lessons learned through broad industry experience can bring insights and spur innovations that single-focus assessments may miss. Objectivity: An internal assessment team’s point of reference can define the scope of its evaluation and color its results. No one wants to be the bearer of bad news. If your processes are unstable, favored suppliers are unreliable, or performance is inconsistent, will an in-house team be willing to acknowledge complicity and make a strong case for change? BUT, to get the most value, it’s important to choose an assessment partner with specialized operational assessment expertise. Expertise: YASH & c5mi’s experts have mastered – and many have pioneered – digital tools in some of the most challenging manufacturing environments. Leveraging our extensive real-world experience, we referenced more than 20 proven supply chain and business models to develop a single configurable assessment model that captures all functions in a business. With hands-on experience merging people, process and technology, we understand the vital role of innovation supported by a flexible governance framework. Flexibility: A single model does not mean we take a singular approach; our assessment was built with flexibility in mind. For example, an engagement to assess complex E2E operations might incorporate more than 140 questions to get a very robust and detailed understanding of the business operation and performance. Addressing a more specific situation, such as an underperforming supplier or facility, might require a more concentrated survey. For a very high-level E2E engagement to produce a quick, robust overview, just 30 key questions may suffice. Practicality: You have a business to run; that’s why, first and foremost, our assessment focuses on ensuring process stability. If your process is stable, we assess system capability against your key performance indicators (KPIs). If your process is unstable, capability can’t be correctly assessed nor should technology applications even be considered. Only when your process is stable and capable do you have process excellence. That is the point at which we evaluate your readiness for technology and how it should be deployed to maximize the return on investment. Sustainability: Once your assessment is complete, we analyze the results to develop a detailed roadmap based on your key business initiatives and objectives. It’s not about what technology can we implement – it’s about which technologies make sense and will bring you the greatest long-term value. 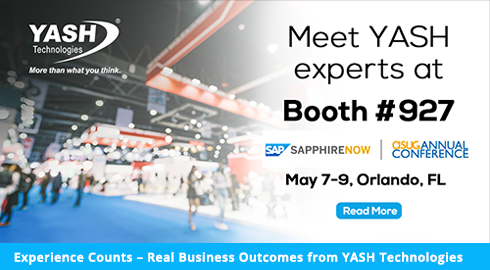 If you’re looking to adopt new tools and technologies to align your systems with your business goals, take a look at YASH & c5mi while you’re at SAPPHIRE. See you at YASH booth #927.